To select your neighborhood, just click on the map below. Or choose from the Neighborhood Area Group in the menu to the right (it will be several inches below if you are on a smart phone). 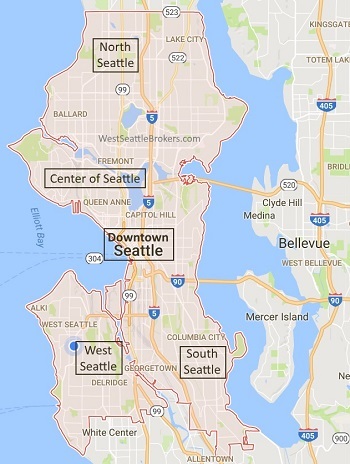 Seattle has many great neighborhoods to choose from. Everyone should enjoy the home they live in, and also the neighborhood the home is in. Seattle has so much to offer. Home styles vary dramatically, from Historic Craftsman to Mid-Century to Modern designs, and everything in between. The neighborhoods differ too - from old tree lined shaded lanes, newer modern suburbs, and even in-city metropolis dwelling. I have over 20 years experience helping people find and purchase Seattle homes, and I live right here in our great city. Let's talk about Seattle real estate.